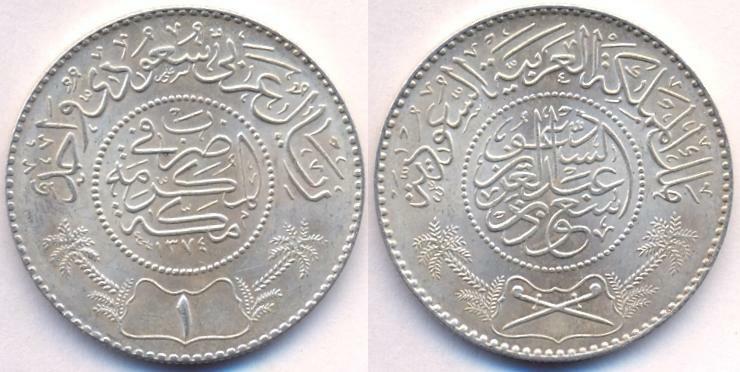 Note: AH1373 dated coins of ¼ Riyal, ½ Riyal and one Riyal were made with the same design and metal as the ones mentioned below, but are considered as samples and were not released for circulation. 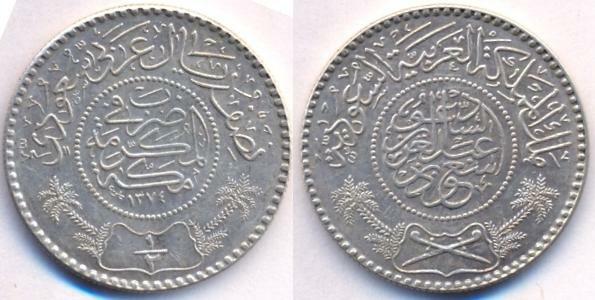 These coins can be seen in Saudi Arabian Monetary Agency (SAMA) catalogues, museum and exhibitions. These three coins are also mentioned in Krause publication as Pn1, Pn2 and Pn3 respectively. Note: Coins were produced during 1954 to 1955 by Mexico mint as indicated in "Memoria de la Dirección de la Casa de Moneda de México correspondiente al año Fiscal de 1952" (Report of the Office of the Mint of Mexico corresponding to the financial year 1952). KM#37 ¼ Riyal. Year: AH1374 (1954). Weight: 2.90g [2.916g]. Metal: 0.917 Silver. Diameter: 19.50 mm. Edge: Reeded. Alignment: Medal. Mint: Mexico. 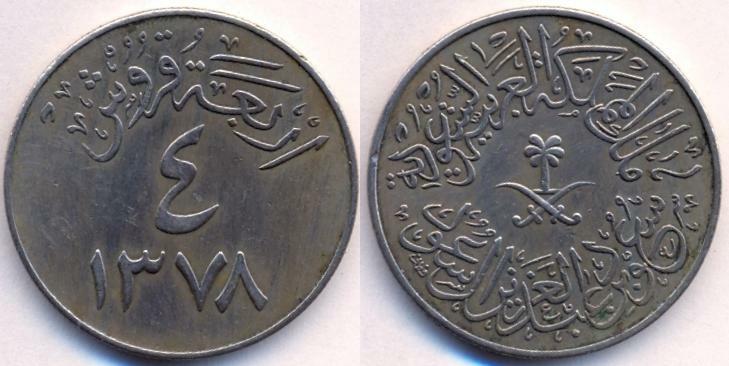 Obverse: "ربع ريال عربي سعودي" (Quarter Riyal of Saudi Arabia) written above. "ضرب في مكة مكرمة" (Struck at Makkah Mukarramah) written within beaded circle with Date below it. Value "٤/١" (1/4) written at the bottom within design flanked by Date tree on both sides. Reverse: "ملك المملكة العربية السعودية" (King of Kingdom of Saudi Arabia) written at the top. "سعود بن عبد العزيز آل سعود" (Saud bin Abdul Aziz Al-Saud) written within beaded circle. Crossed swords at the bottom within design flanked by Date tree on both sides. Mintage: 4,000,000 (produced during 1954-1955). Minted Years: AH1373-1374. Ruler: Saud bin Abdul Aziz Al-Saud. KM#38 ½ Riyal. Year: AH1374 (1954). Weight: 5.87g [5.95g]. Metal: 0.917 Silver. Diameter: 24.25 mm. Edge: Reeded. Alignment: Medal. Mint: Mexico. 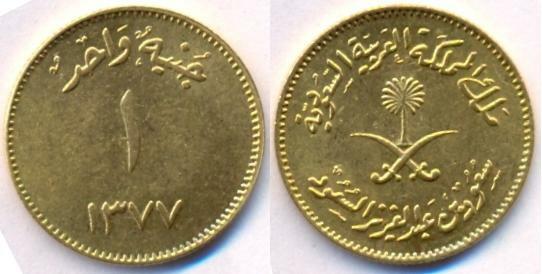 Obverse: "نصف ريال عربي سعودي" (Half Riyal of Saudi Arabia) written above. "ضرب في مكة مكرمة" (Struck at Makkah Mukarramah) written within beaded circle with Date below it. Value "٢/١" (1/2) written at the bottom within design flanked by Date tree on both side. Reverse: "ملك المملكة العربية السعودية" (King of Kingdom of Saudi Arabia) written at the top. "سعود بن عبد العزيز آل سعود" (Saud bin Abdul Aziz Al-Saud) written within beaded circle. Crossed swords at the bottom within design flanked by Date tree on both sides. Mintage: 2,000,000 (produced during 1954-1955). Minted Years: AH1373-1374. Ruler: Saud bin Abdul Al-Saud. KM#39 Riyal. Year: AH1374 (1954). Weight: 11.64g [11.66g]. Metal: 0.917 Silver. Diameter: 30.00 mm. Edge: Reeded. Alignment: Medal. Mint: Mexico. 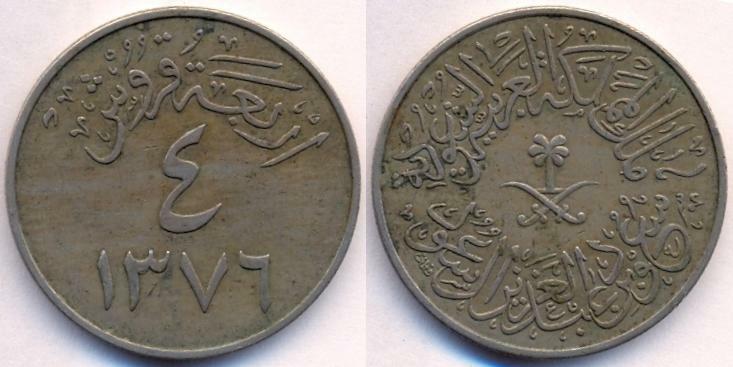 Obverse: "ريال عربي سعودي واحد" (One Riyal of Saudi Arabia) written above. "ضرب في مكة مكرمة" (Struck at Makkah Mukarramah) written within beaded circle with Date below it. Value "١" (1) written at the bottom within design flanked by Date tree on both sides. 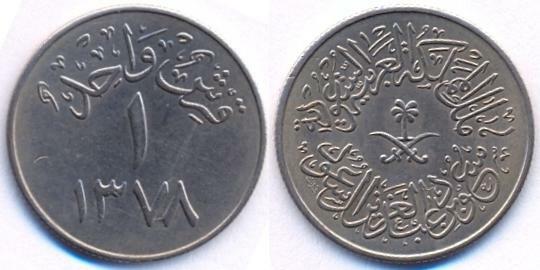 Reverse: "ملك المملكة العربية السعودية" (King of Kingdom of Saudi Arabia) written at the top. "سعود بن عبد العزيز آل سعود" (Saud bin Abdul Aziz Al-Saud) written within beaded circle. Crossed swords at the bottom within design flanked by Date tree on both sides. Mintage: 48,000,000 (produced during 1954-1955). Minted Years: AH1373-1374. Ruler: Saud bin Abdul Al-Saud. KM#40 1 Ghirsh (piastre). Year: AH1376 (1957). Weight: 2.98g [3.00g]. Metal: Copper-Nickel. Diameter: 22.00 mm. Edge: Reeded. Alignment: Medal. Mint: Lahore, Pakistan. Obverse: "قرش واحد" (One Piastre) written at the top. Numeral "١" (1) written in the center. Date at the bottom. Reverse: "ملك المملكة العربية السعودية" (King of Kingdom of Saudi Arabia) written at the top. Crossed swords and Date tree in the center. "سعود بن عبد العزيز آل سعود" (Saud bin Abdul Aziz Al-Saud) written at the bottom. Mintage: 10,000,000. Minted Years: AH1376 and 1378. Ruler: Saud bin Abdul Aziz Al-Saud. KM#41 2 Ghirsh (piastre). Year: AH1376 (1957). Weight: 5.83g [6.00g]. Metal: Copper-Nickel. Diameter: 27.00 mm. Edge: Reeded. Alignment: Medal. Mint: Cairo, Egypt. 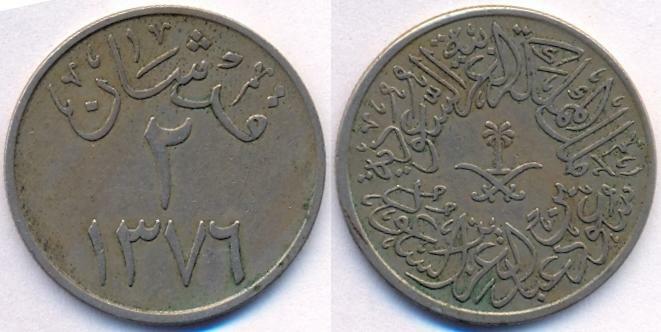 Obverse: "قرشان" (Two Piastres) written at the top. Numeral "٢" (2) written in the center. Date at the bottom. 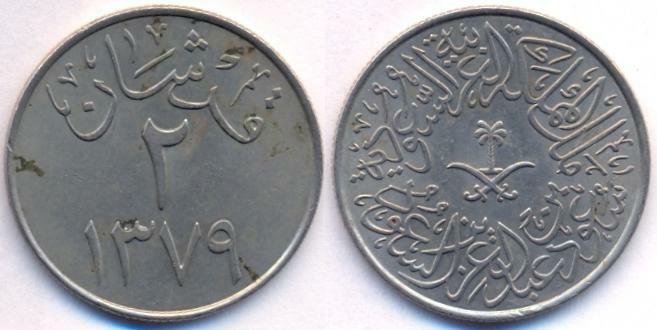 Reverse: "ملك المملكة العربية السعودية" (King of Kingdom of Saudi Arabia) written at the top. Crossed swords and Date tree in the center. "سعود بن عبد العزيز آل سعود" (Saud bin Abdul Aziz Al-Saud) written at the bottom. Mintage: 50,000,000. Minted Years: AH1376 and 1379. Ruler: Saud bin Abdul Aziz Al-Saud. KM#42 4 Ghirsh (piastre). Year: AH1376 (1957). Weight: 11.85g [12.00g]. Metal: Copper-Nickel. Diameter: 30.00 mm. Edge: Reeded. Alignment: Medal. Mint: Lahore, Pakistan. Obverse: "أربعة قروش" (Four Piastres) written at the top. Numeral "٤" (4) written in the center. Date at the bottom. Reverse: "ملك المملكة العربية السعودية" (King of Kingdom of Saudi Arabia) written at the top. Crossed swords and Date tree in the center. "سعود بن عبد العزيز آل سعود" (Saud bin Abdul Aziz Al-Saud) written at the bottom. Mintage: 49,100,000. Minted Years: AH1376 and 1378. Ruler: Saud bin Abdul Aziz Al-Saud. KM#43 Guinea (40 Riyals). Year: AH1377 (1957). Weight: 7.98g [7.9881g]. Metal: 0.917 Gold. Diameter: 22.00 mm. Edge: Reeded. Alignment: Medal. Mint: Lahore, Pakistan. Obverse: "جنيه واحد" (One Guinea) written at the top. Numeral "١" (1) written in the center. Date at the bottom. Reverse: "ملك المملكة العربية السعودية" (King of Kingdom of Saudi Arabia) written at the top. Crossed swords and Date tree in the center. "سعود بن عبد العزيز آل سعود" (Saud bin Abdul Aziz Al-Saud) written at the bottom. Mintage: 1,579,000. Minted Years: One year type. Ruler: Saud bin Abdul Aziz Al-Saud. Note: My coin's obverse side is slightly off-flan, making it slightly rotated. KM#40 1 Ghirsh (piastre). Year: AH1378 (1958). Weight: 2.94g [3.00g]. Metal: Copper-Nickel. Diameter: 22.00 mm. Edge: Reeded. Alignment: Medal. Mint: Lahore, Pakistan. Reverse: "ملك المملكة العربية السعودية" (King of Kingdom of Saudi Arabia) written at the top. Crossed swords and Date tree in the center. "سعود بن عبد العزيز آل سعود" (Saud bin Abdul Aziz Al-Saud) written at the bottom. Mintage: 50,000,000. Minted Years: AH1376 and 1378. Ruler: Saud bin Abdul Aziz Al-Saud. KM#42 4 Ghirsh (piastre). Year: AH1378 (1958). Weight: 11.91g [12.00g]. Metal: Copper-Nickel. Diameter: 30.00 mm. Edge: Reeded. Alignment: Medal. Mint: Lahore, Pakistan. KM#41 2 Ghirsh (piastre). Year: AH1379 (1959). Weight: 5.87g [6.00g]. Metal: Copper-Nickel. Diameter: 27.00 mm. Edge: Reeded. Alignment: Medal. Mint: Cairo, Egypt. Reverse: "ملك المملكة العربية السعودية" (King of Kingdom of Saudi Arabia) written at the top. Crossed swords and Date tree in the center. "سعود بن عبد العزيز آل سعود" (Saud bin Abdul Aziz Al-Saud) written at the bottom. Mintage: 28,110,000. Minted Years: AH1376 and 1379. Ruler: Saud bin Abdul Aziz Al-Saud. SAMA's fourth (current) Currency Law was issued on 1/7/1379H (31/12/1959) authorizing the issue of the official paper currency, enjoying a legal tender status and full power to discharge all public and private debts and obligations. Under the Law, the right to print and mint the Saudi currency shall be the sole privilege of SAMA. The Law also provides for keeping a full cover of gold and convertible foreign currencies against the currency issued. The decimal system was also introduced under which the riyal was divided into twenty qirshes (100 halalas) instead of twenty-two qirshes. KM#44 Halala. Year: AH1383 (1963). Weight: 2.54g [2.50g]. Metal: Bronze. Diameter: 19.00 mm. Edge: Reeded. Alignment: Medal. Mint: Lahore, Pakistan. Obverse: Value "هللة واحدة" (One Halala) written at the top. Numeral "۱" (1) written in the center. Date at the bottom. 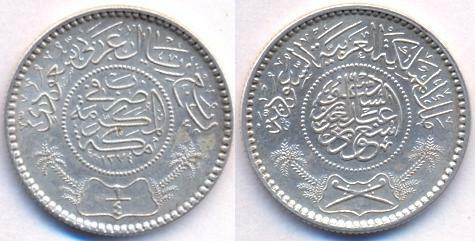 Reverse: "ملك المملكة العربية السعودية" (King of Kingdom of Saudi Arabia) written at the top. Crossed swords and Date tree in the center. "سعود بن عبد العزيز آل سعود" (Saud bin Abdul Aziz Al-Saud) written at the bottom. Mintage: 5,000,000. Minted Years: One year type. Ruler: Saud bin Abdul Aziz Al-Saud. 1517 - 1916: Ottoman Empire. 1917, 1920-1924: Hussain ibn Ali, King of Hejaz. 1925-1930: Abdul Aziz bin Abdul Rahman Al-Saud. 1935, 1937, 1946-1947 and 1950: Abdul Aziz bin Abdul Rahman Al-Saud. 1972-1973: Faisal bin Abdul Aziz Al-Saud. 1976-1978 and 1980: Khalid bin Abdul Aziz Al-Saud. 1988, 1993, 1999 and 2002: Fahad bin Abdul Aziz Al-Saud. 2007-2015: Abdullah bin Abdul Aziz Al-Saud. 2016-date: Salman bin Abdul Aziz Al-Saud.